I'm going to write this post in 60 seconds*. Sure, it's a disservice to the event I'm promoting but I'm trying to get into the spirit of things. I'd hesitate to say that Montreal needs another festival, but this one is so damn cool that I'm sure the city will be better off for it. 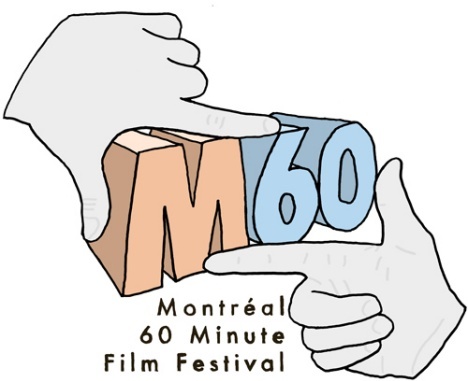 It's the inaugural 60 Minute Film Festival: 60 Filmmakers, 60 Second Films. And when I say filmmakers, I don't just mean people with black turtlenecks, European accents, and thick-rimmed black glasses. I mean you. Anybody who can hold a video-camera or camera-phone or other such moving-picture-recorder device thingy can participate. On July 24th, registration opens with a wicked launch party at Sala Rossa (see details below). Contestants sign up on a first-come, first-served basis. Once registered, you've got a month to make a 60 second masterpiece. What creativity will such limits inspire? What will you film? 60 seconds of eating poutine? 60 seconds of a pizza pop popping? 60 seconds of a plastic bag fluttering in the wind? For more info, check out M60 headquarters. And head over to Sala Rossa on Thursday for the M60 launch party. The event will feature "micro-sets" of movie songs and covers by some talented local acts (Adam & the Amethysts, Receivers, RAGNI, and more). Tickets $7 at the door. *This actually took me 5 minutes. I am hereby eliminated from the contest. **Since I only had 60 seconds, I didn't even get the chance to tell you that festival is organized by one of the guys at the delectable said the gramophone and that there's already a handful of local artists and actors committed to participating. This is gonna be fun.